A great number of sintering powders can be used in the metal sintering process to manufacture a number of sintered parts and components , ranging from iron and carbon steel components and parts, to sintered tungsten and sintered aluminum parts. 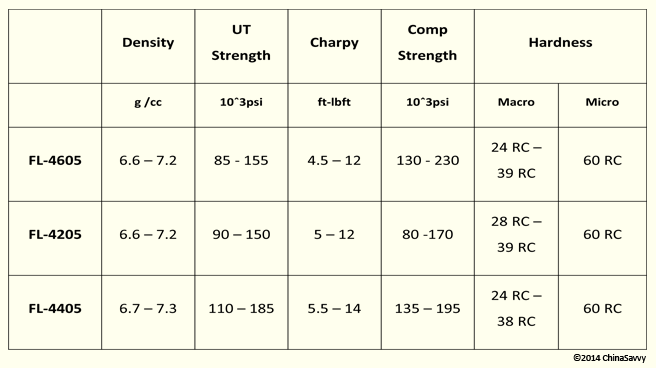 While F-0008 is used in moderate load applications, F-0005 exhibits moderate strength properties and R-0000 is used for light load and soft magnetic applications. 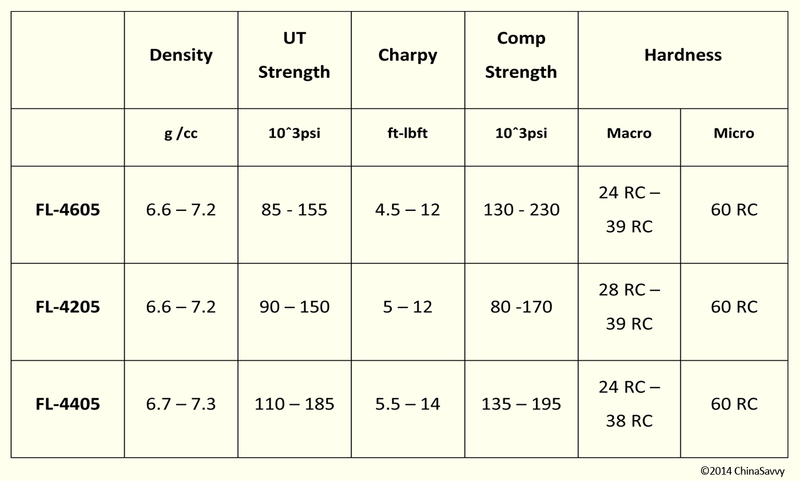 F-008 is used in moderate load applications and F-0005 exhibits moderate strength properties. While FC-0208 and FC-0200 is used in applications where a medium strength is required, FC-1000 is used to produce iron bearings. 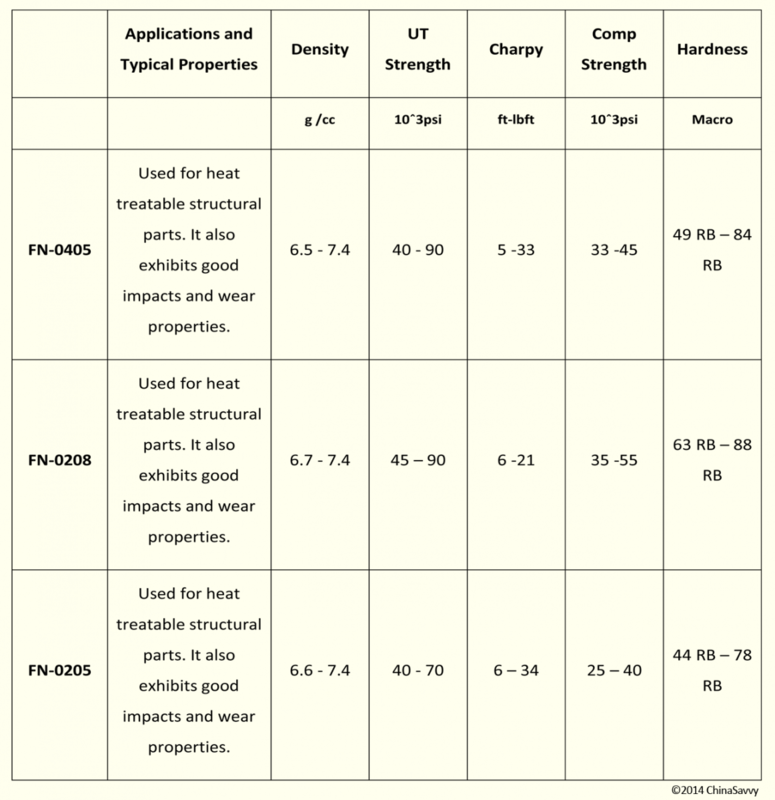 FC-0208 here is used in applications that require medium strength properties. Sintered Iron-Nickel and Nickel Steel powders are used for heat treatable structural parts. Furthermore, these alloys exhibits a good impact and wear properties. 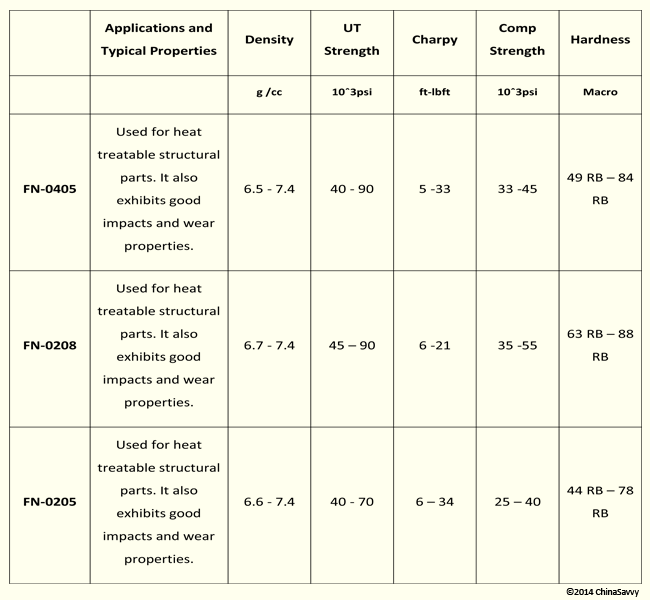 These sintering powders are used for heat treatable structural parts, exhibit a good impact strength as well as beneficial properties against wear. These powder sintering alloys are typically used for heat treatable structural parts and exhibits a high strength and high wear properties. Exhibiting a high resistance to wear and a high strength, these alloys are typically used for heat treatable structural parts. Parts manufactured from these alloys are clean, have a high resistance to wear, closer tolerances and a high strength. These metal sintering alloys are used for heat treatable structural parts and exhibits a high strength and a high resistance to wear. Also used for heat treatable structural parts, these alloys exhibit a high strength anf a high resistance to wear. A heat treatable steel, these alloys exhibit a high strength as well as a high resistance to wear. These alloys exhibit a high strength and a high resistance to wear. While SS-316 H exhibits the best resistance to corrosion, SS-304 N1 offers the highest strength and SS-303 N1 is the best alloy for machining. 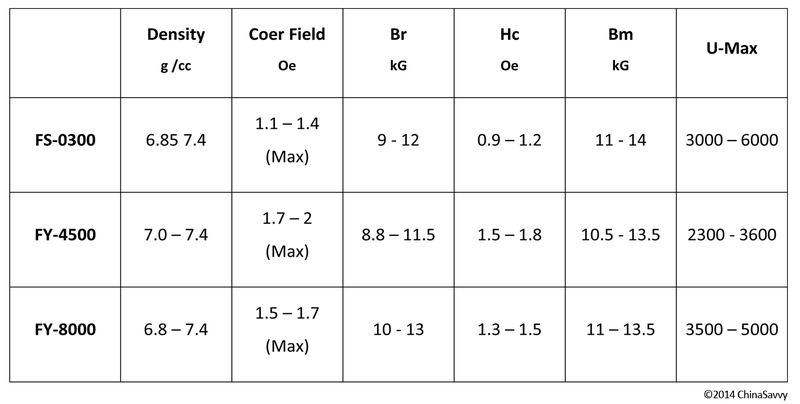 Learn more about stainless steel grades. 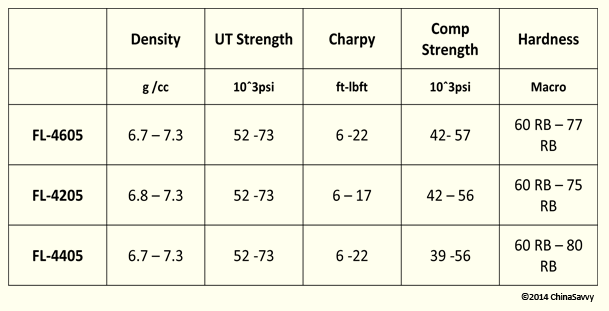 Exhibiting a better resistance to wear than SS-410 L, SS-434 L and SS-430 L is less magnetic than SS-410 L. SS-410 L is uszed in soft magnetic applications. These alloys are used for magnetic responses in DC magnets. CZ-2000 is used in sintered brass applications while CT-1000 is used in sintered bronze applications. C-0000 offers great conductivity characteristics. Please Note that this page does not contain all our available alloys for metal sintering processes. For more information on our sintering materials, please feel free to contact ChinaSavvy.